Regardless of whether there are existing pets in the household, you should not give a new cat(s) the run of the house when you bring them home. Instead, create a safe room where they will remain until they tell us that they are ready to start exploring their new home and potentially meeting the existing cats. 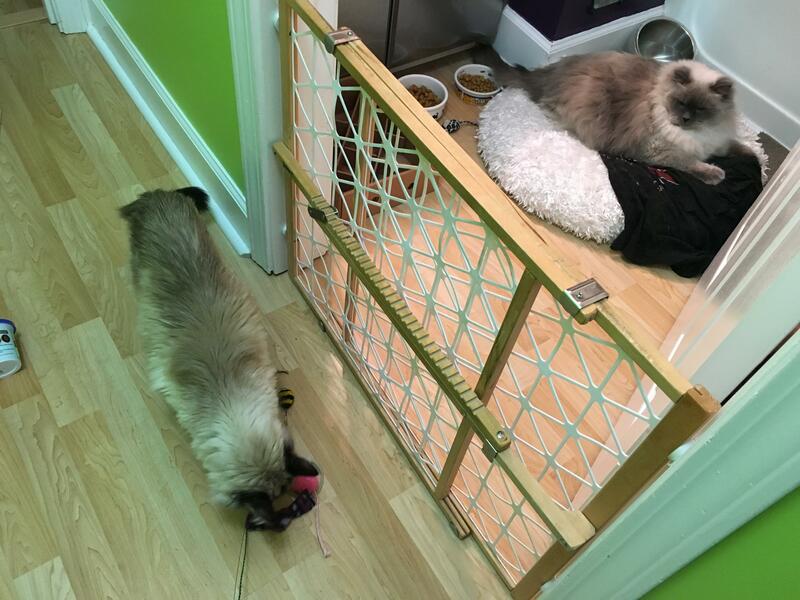 Their safe room should be a cozy area; cats feel comfort in small, confined spaces. Cats are both predator and prey, so when presenting them with a new environment, it is best to start small and allow them to acclimate slowly. This keeps them from feeling threatened and is especially important if the cat is shy or under-socialized. Hiding places should be available, and the cat should be allowed to come out at his or her own pace. Avoid using rooms where the cats can get under large pieces of furniture, such as beds, where you cannot access them, pet them, play with them, or offer treats and encouragement. This is especially important if the cat is timid. 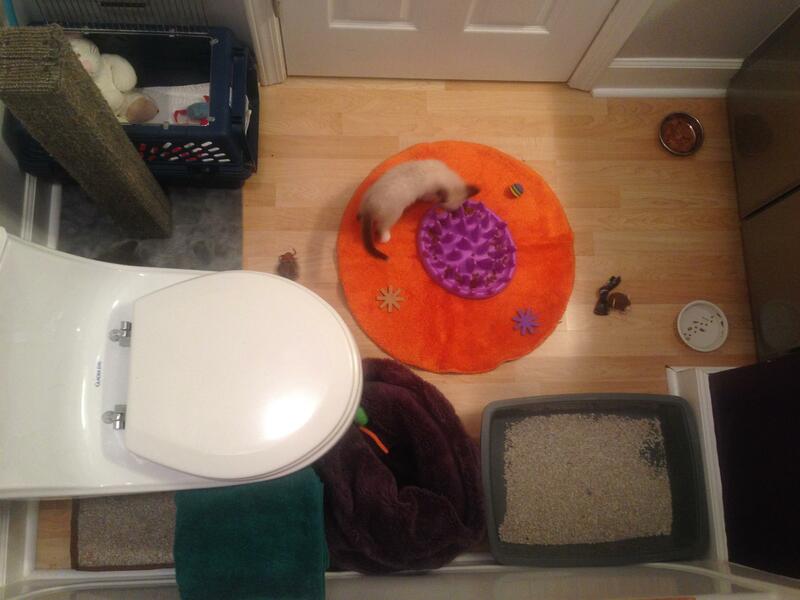 Safe room set up example, adult cat in small bathroom. Safe room set up example for two kittens also in a small bathroom. Set them up in a room where you will be comfortable having resources (food, water, litter) long-term, potentially forever. Cats are creatures of habit and do not welcome abrupt change. 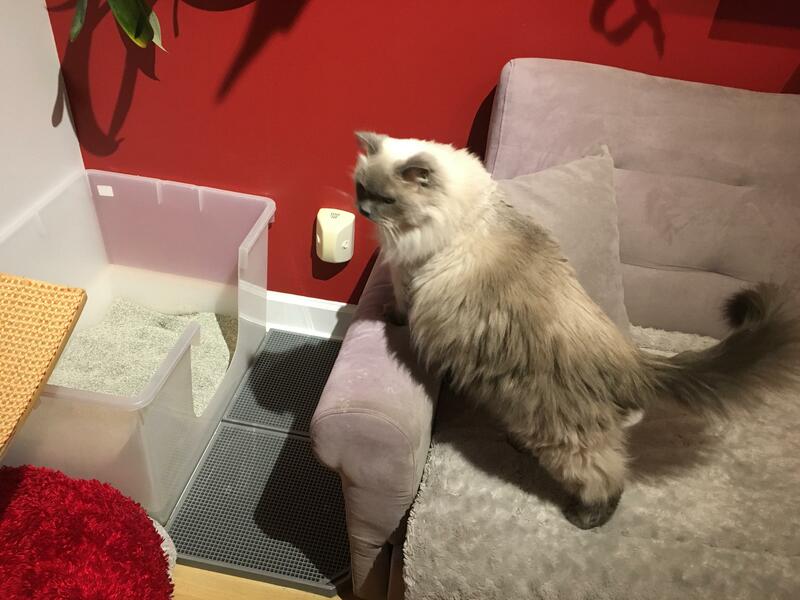 Moving everything out of their safe room to suddenly convert it back into a guest room can be very stressful and result in unwanted behaviors such as eliminating where their litter box used to be or forgoing eating. Make sure that all of the cat’s needs are met in the safe space. Set them up for success! Include at least one scratching post. This is your chance to start them off right, so if you adopted kittens, don’t offer puny kitten products! Give them the real thing that they would use as an adult cat. If space allows, offer more than one litter box. Cats prefer to urinate in one area and defecate in another. 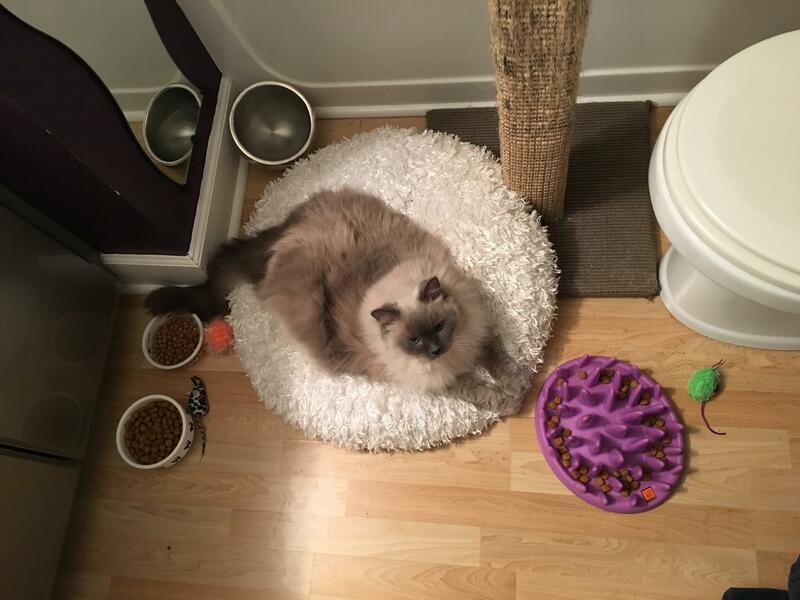 Be sure to offer food, water, solo toys (so they can play when they feel safe and comfortable) and cozy, fuzzy beds. If they will be introduced to other cats, offer easily exchangeable bedding. We will use that later in the process (see our “How to Introduce Cats to Each Other” handout for more information). 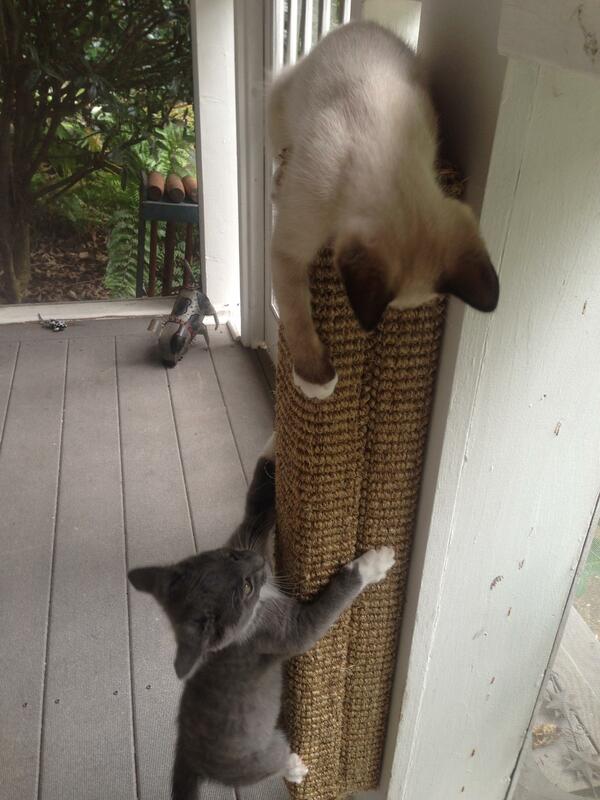 No puny scratching posts for kittens! Give them the real thing to start them off right! This safe room provides several advantages. It’s a place where your new cat can get used to you and other members of the household without feeling overwhelmed by the entire home. If there are other pets in the household, make sure they are not in the room to further intimidate your new cat while they’re exploring this strange new place. Also, as you begin to let the new cat out of the room and into the rest of the house, ensure they can return to their familiar safe place if they start feeling insecure or out of their comfort zone. Make sure the room, as well as the rest of the house, is “cat-proof.” Even if you already have cats who don’t chew on things like electrical cords, your new cat may find them fascinating and can get seriously injured or worse while playing. Also check for strings, ribbons, and small objects that can be swallowed, possibly leading to emergency surgery or even a fatality. Be sure that holes in walls, A/C vents, and ducts are all secured. You will be surprised what a scared cat can fit into! Be sure your new cat is microchipped and start acclimating them to wearing a collar. You never know if you will have an emergency like a break-in or house fire. Be prepared! The best form of ID, should your new cat escape from the home, is a safe cat break-away collar with a microchip as a back-up if the collar comes off. When you bring your new cat home, immediately put them in the safe room with the door closed. Open the carrier and let them come out on their own. If there are other animals in the house, it is imperative that you do not set the cat carrier down and allow the existing animals to approach. This is threatening and frightening to the cat trapped in the carrier! Initially, they may be shy or frightened and may find a place where they can gather themselves and feel safe before checking things out. Cats feel safe either under things (beds, couches) or up high (cat condos, dressers, cabinets). Eventually, they will begin exploring their new digs, often at night when it is dark. Offer nightlights in the safe room. A cat’s vision is at its best in low, dim light. Over the next few days, make sure the cat is eating well and using the litter box. Any kind of change can be stressful to a cat, and moving to a new home is one of the most stressful events your cat will encounter. Because of this, it is not uncommon for cats to break with a cold or other illness after moving to a new home. Call your veterinarian immediately if you notice signs of illness. Once the new cat is eating, drinking, and eliminating normally, it is time to start the introduction process to the rest of the home and/or to the other pets. You will know they are ready when they are eager to see you when you enter the room and curious about what is on the other side of the door. If they are still frozen with fear and hiding, it is not time to move forward to give them even more space. They will only feel more overwhelmed. You will have the rest of your lives together. DO NOT rush or force things, as humans tend to do. Even when we think we are taking things slow, it is never slow enough for a cat! You may simply open the door so that your new cat can exit the room and retreat back to the safe room if needed. DO NOT force them to exit their safe room. Some cats will be perfectly content in this new room for weeks. Others will be eager to explore. Always go at your cat’s pace. Place resources throughout the home, so as your new cat peruses the place, they learn where other sources of food, water, litter, and scratching posts are located. Use food, treats, and interactive lure toys to make the exploration a positive and fun experience! Gradually increase the amount of time they are allowed outside of their safe room, eventually only putting them back in when you cannot supervise (in bed, at work). Depending on the individual cat or kitten’s needs, most will be able to enjoy the run of the house within a few weeks. For more timid individuals, you may start by placing a baby gate across the doorway threshold before opening the door all the way. They may feel more inclined to approach the threshold with this “visual barrier” in place. You can then feed them their meals at this visual barrier, eventually removing it and feeding them in the open doorway threshold. You can utilize food or play to encourage them to take a few steps out of the room. Play increases confidence and decreases stress. Use this tool to your advantage. They may only come two feet out of the room before retreating back, but that is okay! Use play to lure them out of the room AND back in to increase their confidence to cross the threshold. 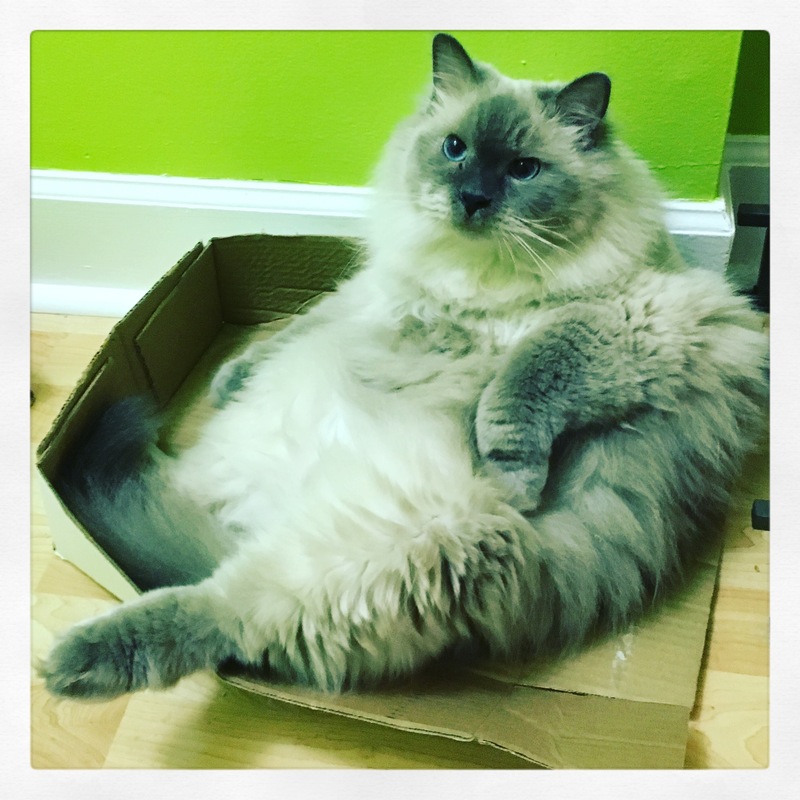 By taking things slowly and using the techniques described here, your new cat will grow to feel comfortable and confident in their new home. The other cats are confined so there are no threats during exploration. Seniors often do not require double stacking. If you will be introducing your cat to other cats, please see our “How to Introduce Cats to Each Other” handout. If you will be introducing your cat to a dog, please see our “Introducing a Dog and a Cat” handout. 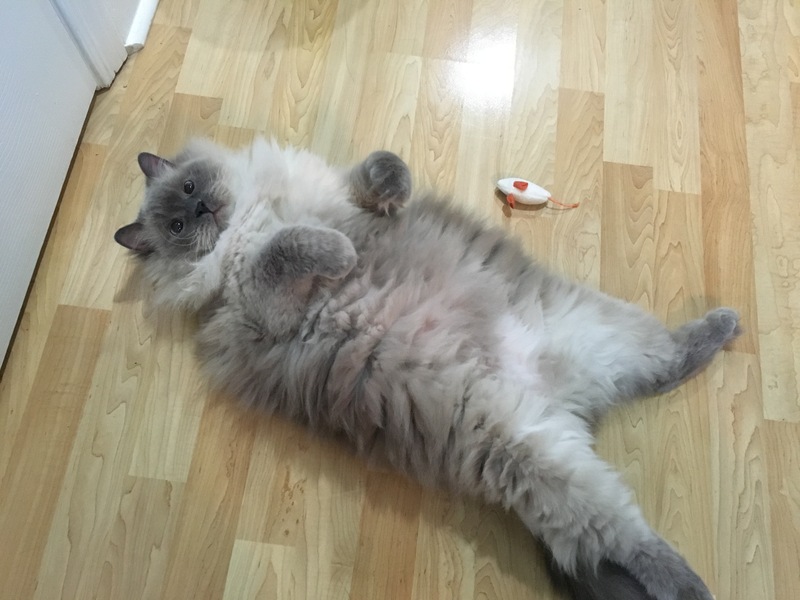 If you follow these steps & take it slow your cat might just be as relaxed as Samson! Having cardboard boxes etc. to hide in create comfort in a strange place.